My goth heart fluttered this morning when The Chilling Adventures of Sabrina announced the release date for Part 2. 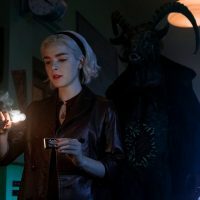 Sabrina, and the Dark Lord, returns to Netflix on April 5th. I can’t wait to get back to practicing with my coven. break up with your boyfriends. the dark lord has other plans. CAOS returns April 5.